Cinematographer Ron Fricke's first project was as camerman and writer in 1983 on the awe-inspiring Godfrey Reggio film, Koyaanisqatsi (a Hopi word that means "Life out of balance"). Featuring a montage of images including impressive time lapse effects, the world around us was given new perspective, set to Phillip Glass' haunting musical score—the film had no other narrative. Baraka, produced almost a decade later, shares many of the stylings of the earlier work, but builds on the complexity of long, time lapse sequences, aided by more modern computer-controlled cranes. The effect is mesmerising, forcing the viewer to relate to the film through their own emotional reactions to the images and soundscapes offered. Capturing scenes and images from around the globe, Baraka is an assault on the senses, creating a visual palette of textures, straining the imagination with its richness of color and sense of depth, and ethereal segments in which movement and time are distilled through time lapse, slow motion or arial photography. Breathtaking vistas, majestic architecture, and human ritual combine in this display of contrasts. No emotion is left untouched, whether it be raw beauty or overwhelming devastation. In an age where we have become increasingly desensitized by the constant bombardment of shocking images in the news media, when a film concentrates this stimulus set against evocative music, the effect can be overpowering, and Baraka is not for those viewers who may be overly sensitive. Human realities are presented in a frank, and often unsettling manner. Concentration camps, funeral pyres, chicken factories and oil fires are juxtaposed with natural landscapes, and dozens of incredibly complex time-altered sequences. The spectacle of religious ritual is displayed from cultures across the globe. Human and natural environments are shown in their diversity and similarity. Whatever falls before the lens takes on new meaning as its context is contrasted with what preceeds and follows. The experience is intense, mystifying, elating and sometimes depressing. The soundtrack is integral to the film's impact, as it sets the tone for the visuals at all times, immersing the viewer in an aural landscape. From the massive Koto drums to haunting solo voice, Michael Stearns' score is enveloping, encompassing instruments and styles from around the globe, adding to the exhilaration and intensity of the visuals, to the point of being ovewhelming. Regardless of the words used to describe a film like Baraka, none can equal the experience of watching it; the combination of visuals and audio transport the viewer into a unique space, and one that I believe can't help but affect the audience on many levels, and in many ways. This is the world around us, in all its beauty and its horror, the light and the dark, and the fragile balance that holds this tiny planet we call home together. This is an incredibly powerful film. MPI had previously released Baraka on DVD, but as I noted in my earlier review of that disc, the release did not do justice to the exquisite 70mm photography and subjects, with a nonanamorphic transfer on a single layer. This edition devotes both layers of an RSDL disc to a new anamorphic transfer from the 70mm elements, and the payoff is substantial. Image Transfer Review: After the disappointment of MPI's first DVD release of Baraka, this is nothing short of a revelation. Every one of my criticisms with the last version are gone. The image here is breathtaking, and the new anamorphic transfer and use of dual layers has really paid off. Colors are vibrant, contrast is bang-on, detail is incredible, and compression artifacts, which plagued the last version, are nowhere to be seen. The complexities of these images are enormous, yet they remain rock solid, with no aliasing, random floating or any other anomalies. A few scenes do have more grain than others, but these are obviously due to the stock used. Outside of having a film element for this picture, I can't see how there could be any improvement here. Audio Transfer Review: Like the previous edition, the soundtrack is very well presented. Both 5.1 Dolby Digital tracks and the 2.0 stereo mix sound fantastic. There are no technical deficiencies here, and with the rich, full soundcape offered, your subwoofer and surround channels will not be wanting for material to address. Extras Review: The disc features the same 8m:09s making-of featurette included on the first edition, which is quite informative. Director Ron Fricke and producer Mark Magidson discuss the making of the film and their reasons behind capturing what they did. The process entailed hauling their computer-driven 70mm equipment to the far reaches of the Earth, and around the globe three times during the shoot. The emphasis is not on the 24 countries they shot in; in this case the names of the places are not as important as what they found there. The MPI DVD catalogue is also available with short overviews of each title. The enclosed booklet lists the film's locations with a world map. It would have been interesting to have a chapter by chapter listing of each location, though the filmmakers suggest this is unimportant. 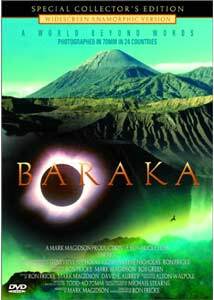 Like its predecessor, Koyaanisqatsi, to me, Baraka is an intensly spiritual and emotional experience. It is not the type of film I can watch passively, as it draws you into the world of human and natural existence in a profoundly powerful way. While its message may be a bit heavy-handed at times, it is quite thought-provoking, and the beauty of the photography is simply stunning. Coupled with an exquisite and moving soundtrack, this is a prize in any film collection, and is finally done justice on DVD. I highly recommend this, even if only for a rental. You may not like it, but you will never forget it.